Thrift stores! As a Steampunk, they can be your best friend, but it's easy to make a tragic mistake. This hands-on guide will help you navigate the murky waters of successful thrifting in order to find the hidden gems that will make your Steampunk outfit complete! Presumably everyone knows what a thrift store is, but you may have trouble finding the good ones in your city. Most big cities (and some small ones) have at least a Salvation Army and/or a Goodwill, though many cities will also have countless small, independent thrift stores. The best way to find them is to use the yellow pages or Yelp for "thrift store" or "second-hand shop", though I also recommend just asking around. Your local Steampunks may be able to refer you to the better ones, or alternately the employees at one store will likely know many others. Before we move on to the actual clothes that I found, let's talk strategy. 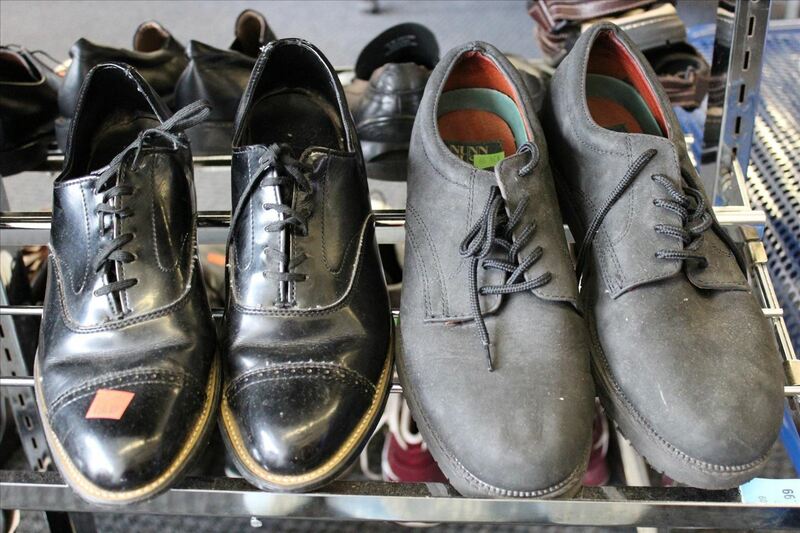 Thrifting is almost an art form, and there are definitely right and wrong ways to do it. First, and most importantly, never let anything you intend to purchase out of arms' reach. I've seen fights break out in thrift stores over things that someone walked away from, and I'm not even kidding. It's brutal and totally merciless out there in the world of thrift-store shopping. Second, many thrift stores will have a day of the week when clothes are half-off. Take advantage of this. Thrift-store clothes are already cheap, but it's awesome to walk out of a store carrying a huge bundle of clothes that you paid $10 for. Plus, when things are that cheap, it's not a huge deal if one or more items don't work out. Third, shop often. 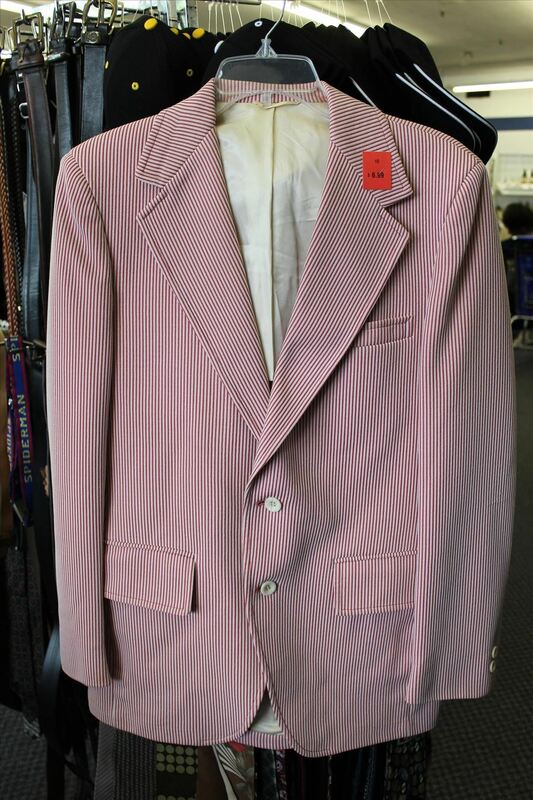 Thrift stores are totally luck-of-the-draw, so there's never any guarantee that you'll find something you need. A few days before a convention is not the right time to go thrifting, because you will never find what you're looking for when you need it. It's one of those things, like Murphy's law. You always find what you want when you aren't really looking for it. Okay, now on to the clothes! I'm going to break this guide down into two sections: bad clothes and good clothes. I've put the "bad" section first because it's the most important. It's massively time-consuming to evaluate every single item in a thrift store, so what you need to do is learn how to dismiss things that don't work. 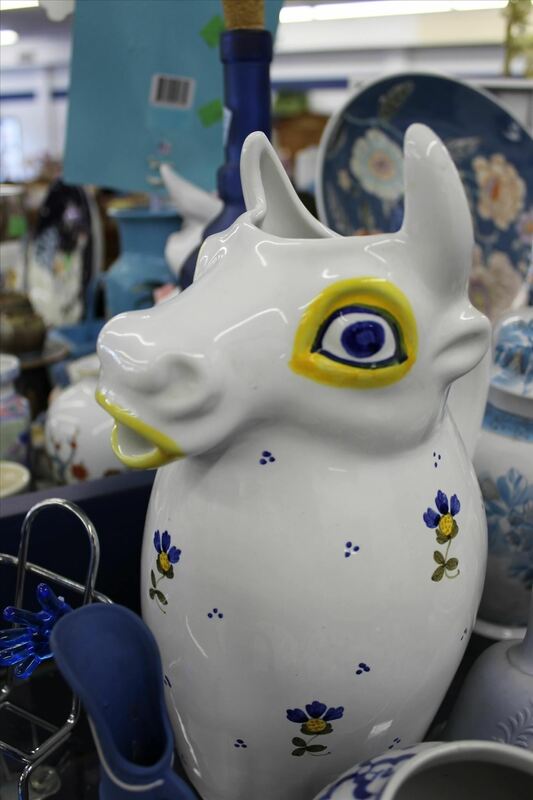 Thrift stores are full of crazy stuff, like this... cow pitcher? Don't get distracted! Stay on target! First lesson: Just because it's brown, that doesn't mean it's Steampunk. Take this jacket, for instance. 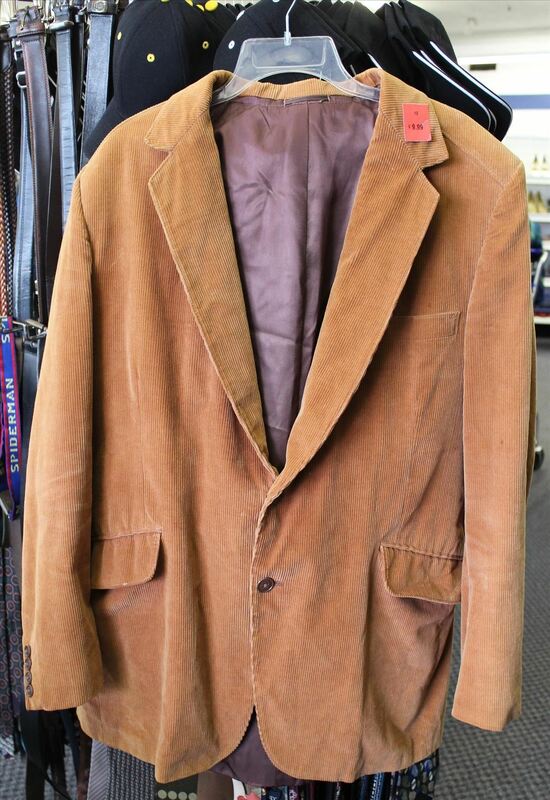 It's brown corduroy, but is way too modern and boring to make part of a good Steampunk outfit. Pass this guy over immediately. 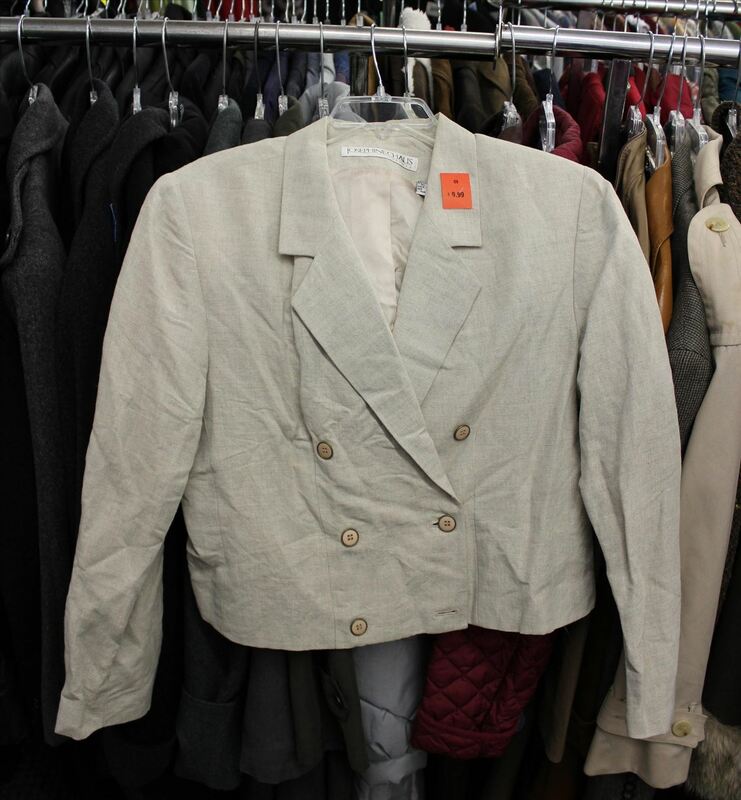 This women's jacket below might tempt some people because of its vaguely military look, but the shoulders are too broad and it will look exactly like what it is: a women's suit jacket from the 1980's. The jacket below walks the fine, fine line between what is and isn't Steampunk. You might be attracted to the cool designs and Steampunk-y look to this jacket, but don't be fooled! 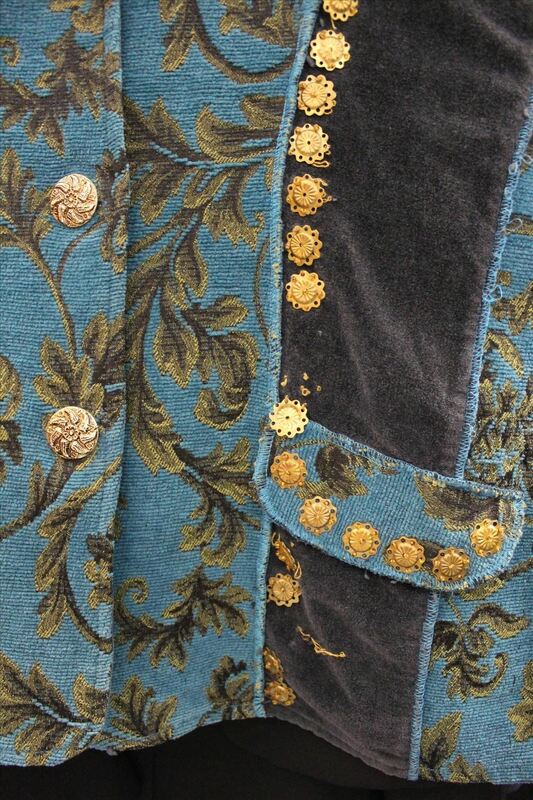 The jacket is full of all kinds of details that scream 1970. Lesson two: the 1970's are not Steampunk. Note how the fabric is almost knitted, and the buttons are suns. This jacket is aaaaalmost Steampunk, but it just has too much of the 1970s in it. Wearing this would make you look more like a hippie than you may be comfortable with. 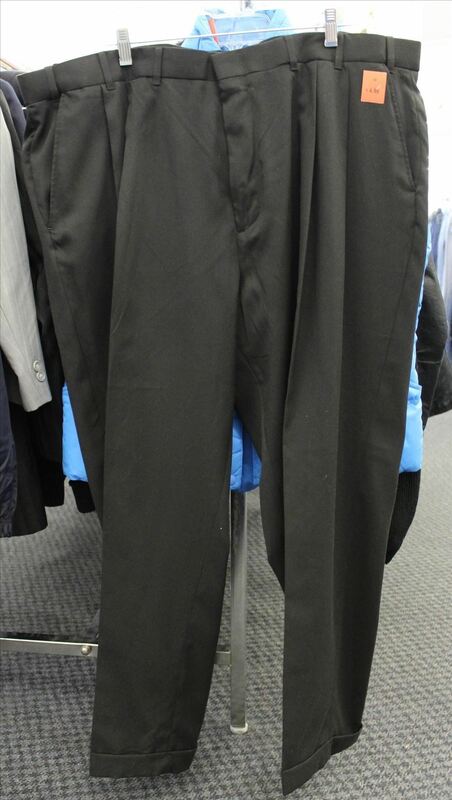 These are suit pants. Many men wear pants like this with their Steampunk outfits, and they just don't look very good. Why? Because they're pleated. Many modern men's dress pants have pleats, and they just look terrible for Steampunk. Personally, I think they look terrible in general, but your mileage may vary. Still, just look at how awful these look when hanging. They don't look much better on. 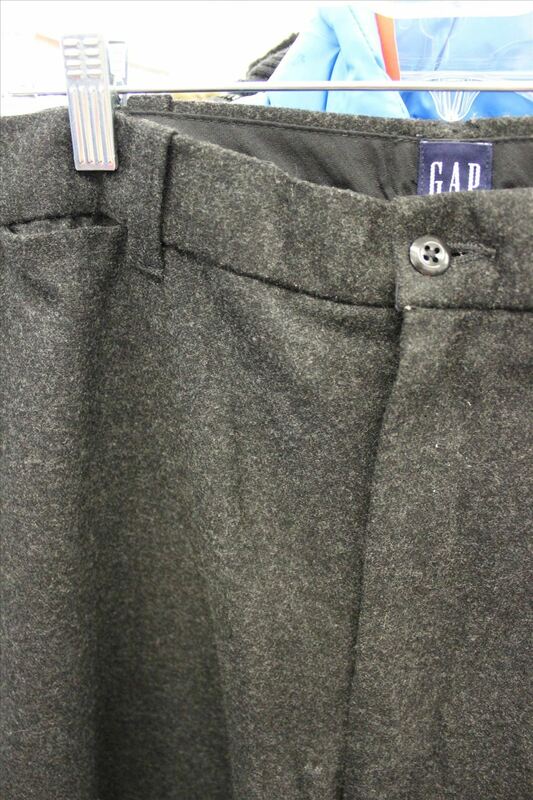 These pants below are a real shame. They're a shame because the fabric is amazing, and I love it, but they're pleated and would look awful. 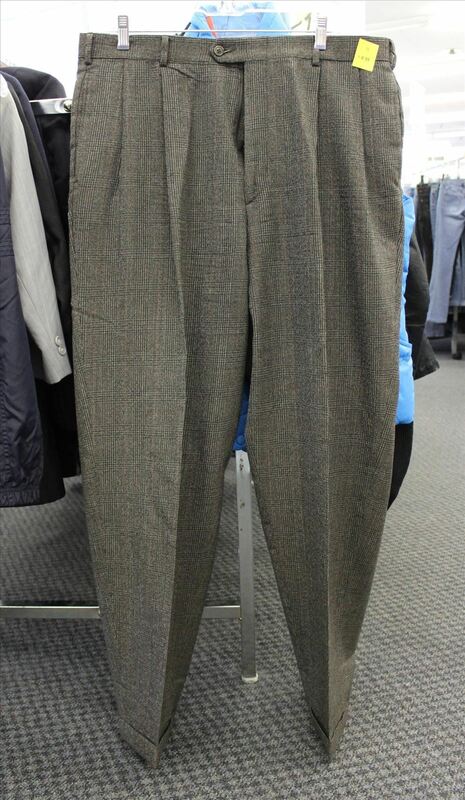 The pleats make the pants look like they're from the 1980's rather than the 1880's. 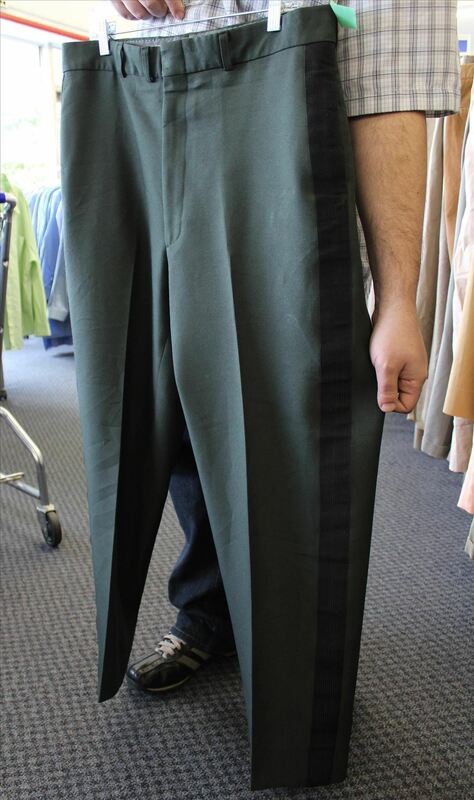 If you see a pair of pants with pleats, just immediately skip them. To some, this denim jumpsuit below may have some Steampunk characteristics, but just don't do it! They're way too modern and urban, and would end up conflicting with the rest of your Steampunk outfit. Okay, ready to move on to the good stuff? Well, I am! The good clothes are hard to find, and when you do find them, more often than not they don't fit. If you find something you love and it just barely doesn't fit, too bad. Leave it and move on. You don't want to waste time and energy on something that will make you look awful! So, here are some things that are either inherently pretty Steampunk, or could easily be used in a Steampunk outfit. 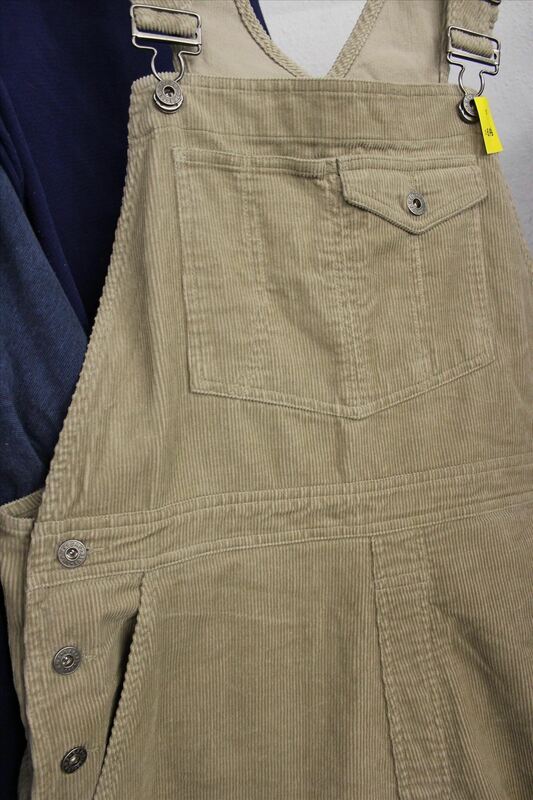 In contrast to the above denim jumpsuit, here's a pair of overalls that would easily work for Steampunk. They're corduroy, and are an old style. Note the cool pocket on the front bib, and the buttons on the sides. A Steampunk mechanic or engineer could easily wear this. Look at this awesome women's jacket below. 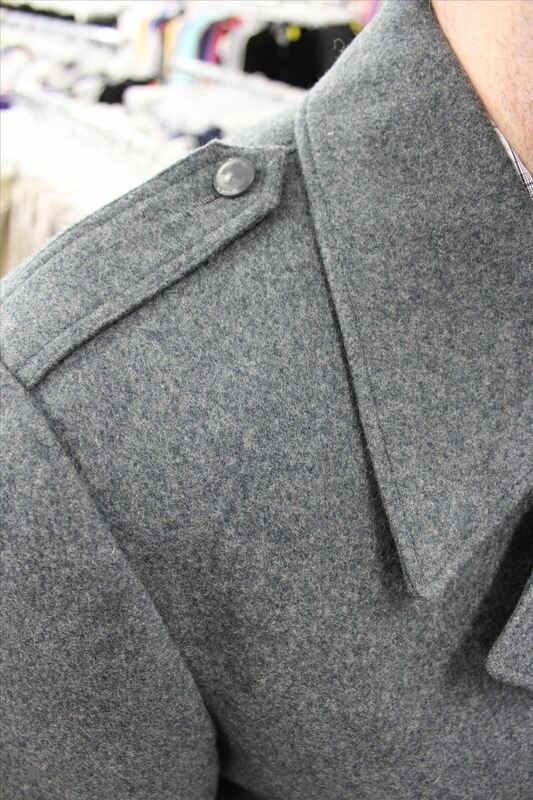 The standing collar is very Victorian, as are the lines of the jacket. Even the back has nice details that would look right at home in a Steampunk or Victorian outfit. 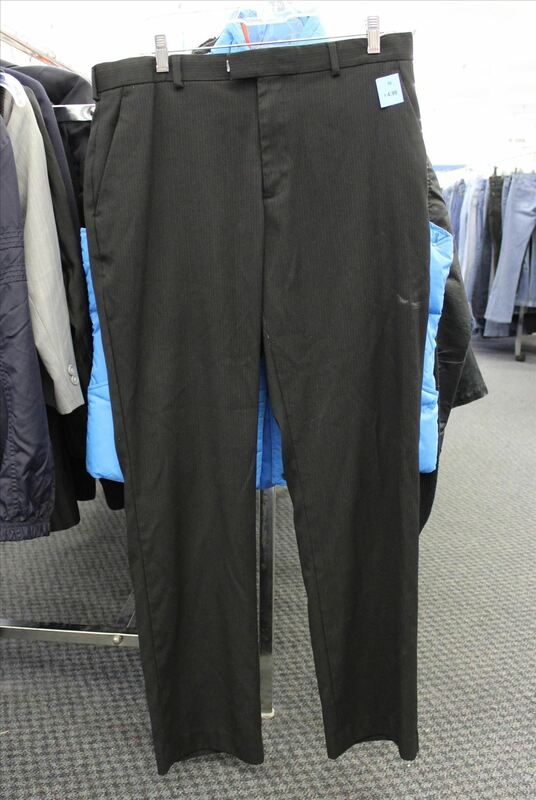 Now, this is a satisfactory pair of men's pants. Note the flat front, with no pleats. It has metal catches at the waist instead of buttons, but that doesn't matter because if someone can see the waistband of your pants, in all likelihood you're doing it wrong. Men would almost always have a waistcoat (a vest) buttoned over their pants. 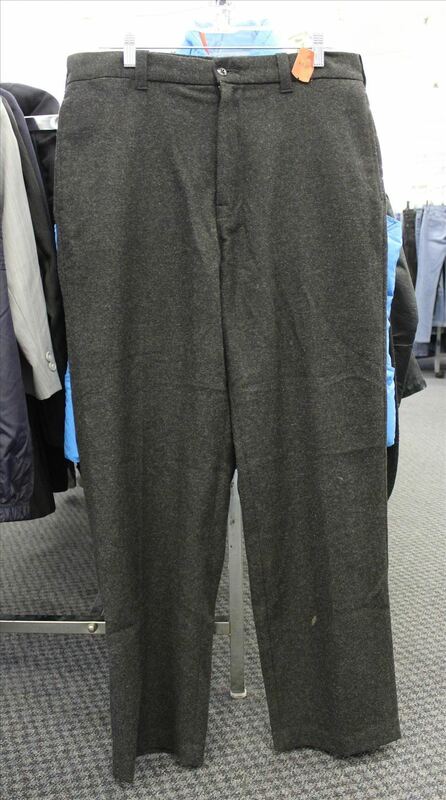 These are awesome pants, because they're flat front and also made of wool! Or some synthetic equivalent. They look really luxurious in person! The best part? Look where they're from! Yeah, that's right... the Gap! Hey, nothing wrong with that. Steampunk is all about pulling things together from surprising sources! Speaking of surprising sources, check out these green pants with a black stripe running down the legs. These pants must have originally been for a marching band or something, but they would happily live a second life as Steampunk pants! Speaking of second lives, I have no idea where these hideous shorts came from, but they would also be happy to live a second life as Steampunk underwear! The more I stare at those stripes, the more they try to steal my soul from out of my eyes. Speaking of stripes, check out this jacket. While it isn't Steampunk per se, it absolutely reeks of the Edwardian era. Pair it with a straw hat, and you've got yourself an outfit! The Edwardian era is a little late for normal Steampunk, but it will fit in just fine if you do it properly. 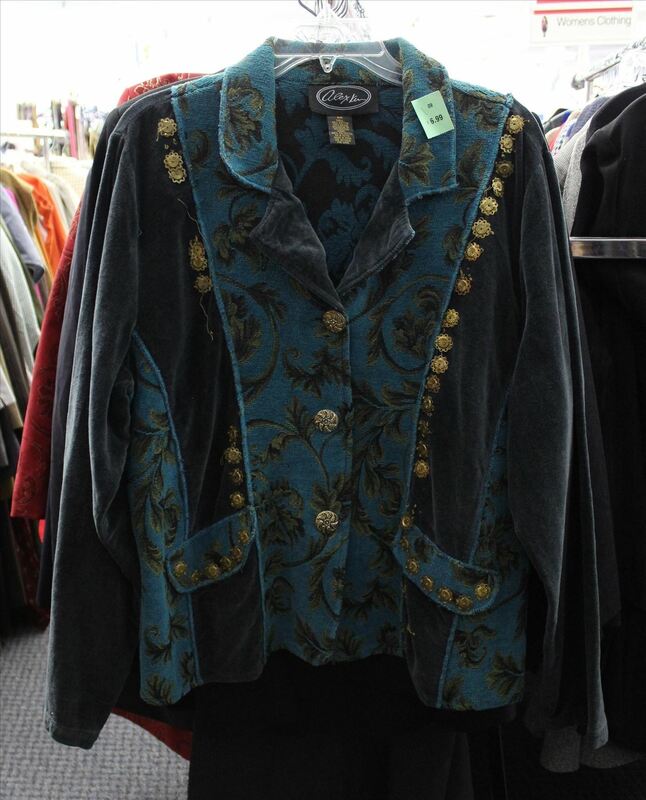 This jacket below, my find of the day, is also too late for Steampunk. 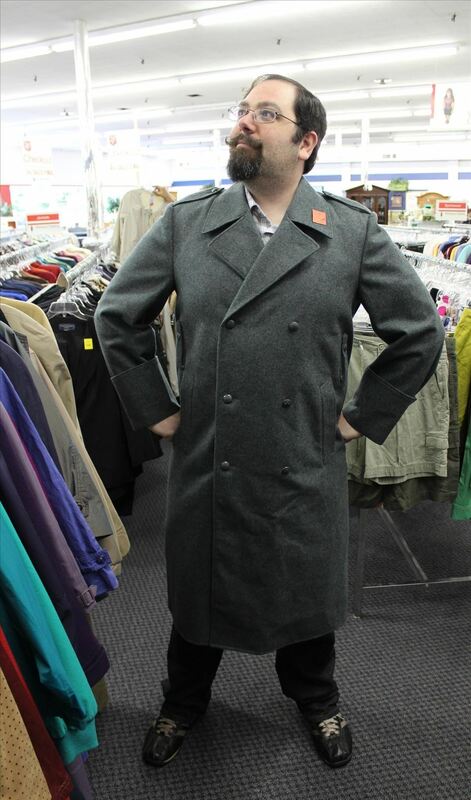 This is a reproduction World War II greatcoat, such as Captain Jack Harkness wears in "Doctor Who". While it's a little late for Steampunk, it would make an excellent Dieselpunk piece! I'm proud of it, so you'll just have to deal with a few pictures of it. It's made of real wool, and it's darn heavy! Also, it was only $20. A little expensive for a thrift store, but well worth it! Now, here's a dress that walks the line between Steampunk and not, and could come down on either side of the fence depending on how you wear it. If you wear it as a dress, it will be too modern. However, a modern dress might actually make good Steampunk underwear! 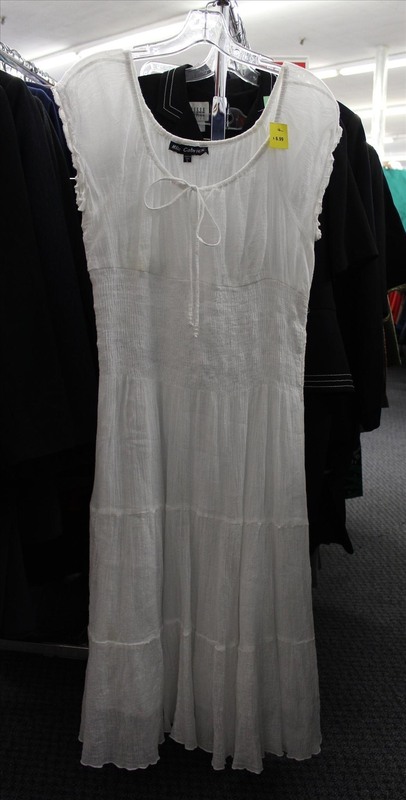 Victorian women wore shifts under their dresses, and it's hard to find a good shift today, so why not substitute a light cotton dress like this? If the top of it peeks out, that'll be okay, too! 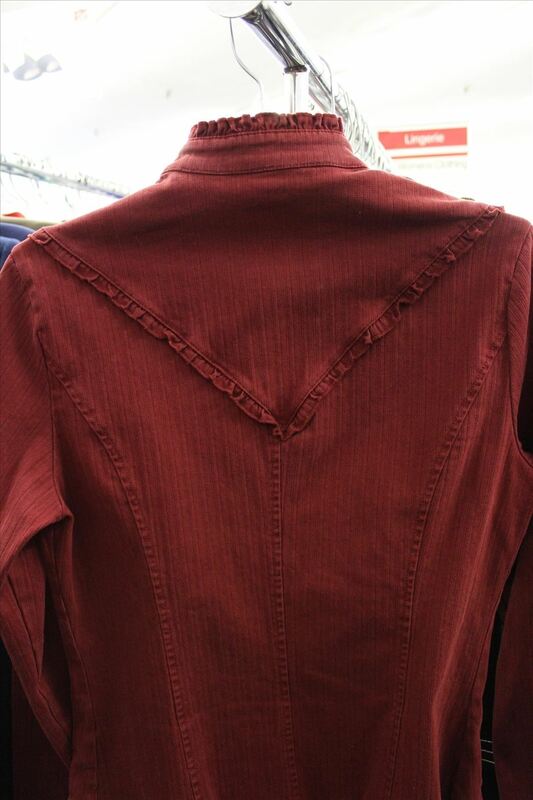 This blouse below is pretty much a perfect Steampunk top. 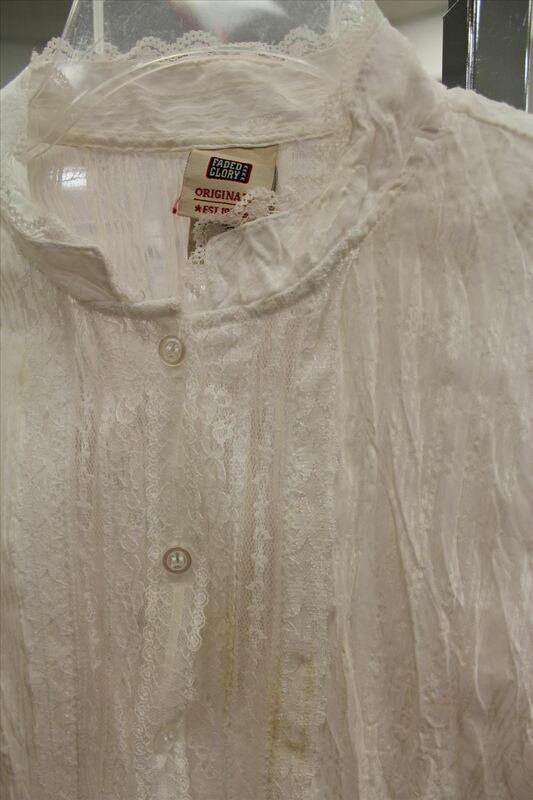 Look at all the lace and detailing, as well as the standing collar that was so popular at the time! Phew! That was a lot of clothing! However, this guide doesn't stop here... 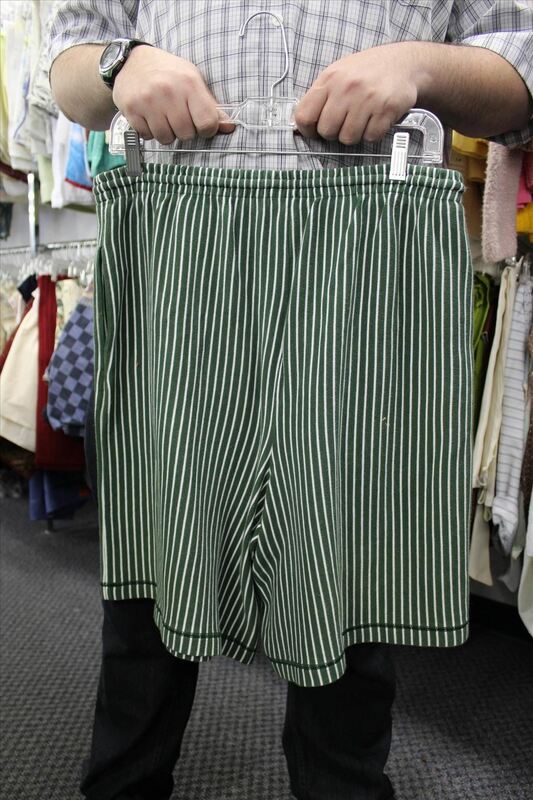 There's more than just clothes at thrift stores, and you can sometimes even use it as a one-stop shop! Yup, shoes. Most of the shoes you find will almost certainly be totally useless, but every now and then you'll find a good pair. Gentlemen, you in particular are often guilty of buying the wrong pair of shoes. Here's a handy comparison between the right shoes (pictured on left below) and the wrong pair (pictured on right below). The left pair might be more uncomfortable, but we all make sacrifices for fashion! They would work great for the right outfit. I loves them! The two belts below are another good/bad comparison. 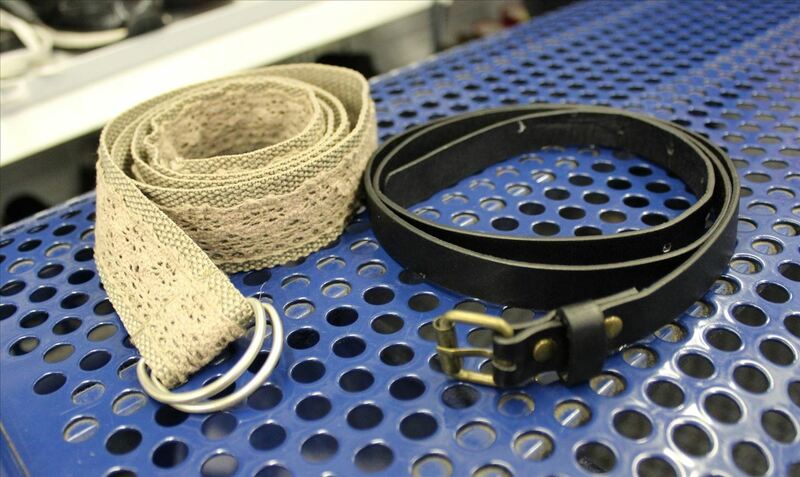 The belt on the left below might stand out to a Steampunk since it's olive-colored and has cream-colored lace, but that style of belt is way too modern, and would be far more at home in a Dieselpunk outfit. In contrast, the simple black belt with brass buckle is a perfect accessory for a Steampunk outfit! Belts easily add a little extra zest to your outfit, especially when you aren't using them to keep your pants up. What! We're not done yet? Thrift stores also carry a wide variety of, well, junk. Some of that junk can be used for making Steampunk props! 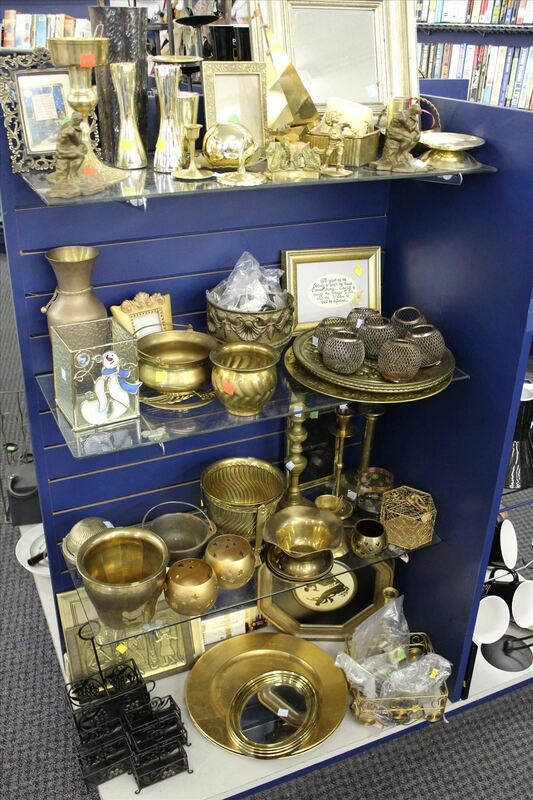 This particular thrift store, a Salvation Army, conveniently separated its metal items by the type of metal, so the brass objects are all together! Hidden in the back are a few candlesticks! Brass candlesticks make excellent gun barrels for your Steampunk weapons, and you can get them for super cheap at the thrift store. There's usually also an assortment of plastic toys and sporting equipment that you can potentially make something out of. Thrift stores are just such a great resource for the Steampunk who doesn't want to spend a lot of money, so take what you've learned here, and go apply it! 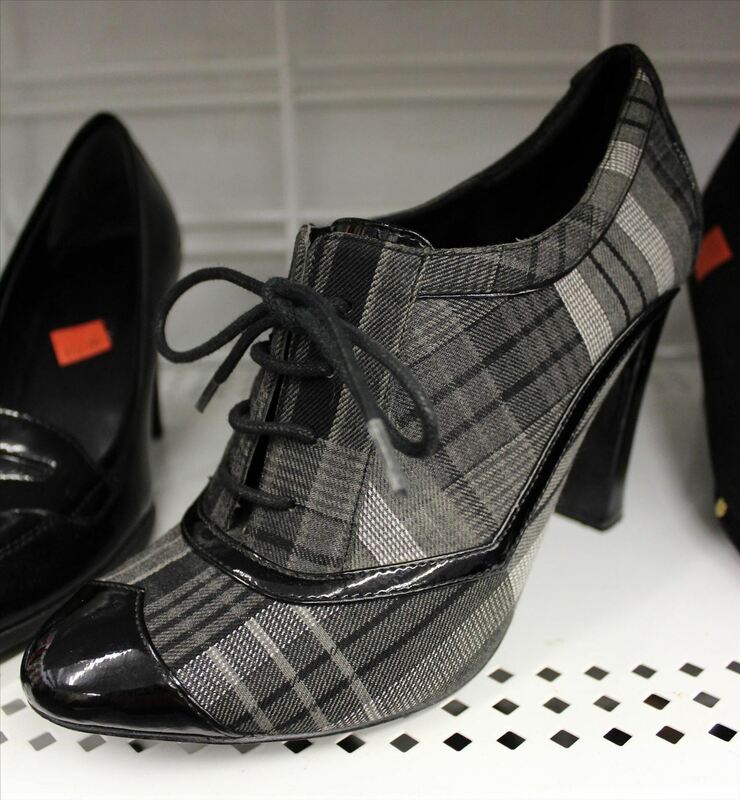 Every trip to the thrift store is a surprise and an adventure... You never know what amazing thing you'll find! Another tip: It's better to go thrift shopping with someone not your size or with very, very different taste. That way you don't get in weird awkward "Well, you saw it first." "No, it would look better on you." matches. Or fisticuffs. Depends on the friends. That way you can keep a look-out for stuff for each other, too. Such a great point, Jessica! I can't believe I forgot to mention that, so thanks for stepping up! I always stop by the purses. Some of the small leather clutches make great all purpose pouches and the straps are great sources of D rings and buckles. Also the toys, where I have never paid more than $1.50 for a Maverick. Non chain stores are the best, Goodwill stores are usually over priced. You are correct about going frequently, the inventory changes daily. Great points, Stephen! I never even thought of scavenging parts from purses! However, I frequently enjoy raiding the toy section and the housewares section. You really just never know what amazing thing you're gonna find! I love the purses too, though it is actually a bit overwhelming for me (because I am a woman who loves a good handbag!). I have to pull back and look at it from the point of cannibalizing a beautiful leather (or pleather) piece. To slice it in order to slide a belt through though it amazing! 2 second pouch!!! I'd buy the 1970's jacket. Then I'd disassemble it completely. The buttons and odd trim pieces are keepers, have you priced buttons lately? I often buy horrible pieces JUST to get at their buttons. The fabric pieces could be reused for hat trimming, or even a small hat if you're a good sewer. Or, think spats. Or deconstruct it (carefully take it apart) re-cut using your fav steampunk/deiselpunk pattern and put it back together. It's work, yes, but it is alot cheaper, and you get to use high quality fabrics. 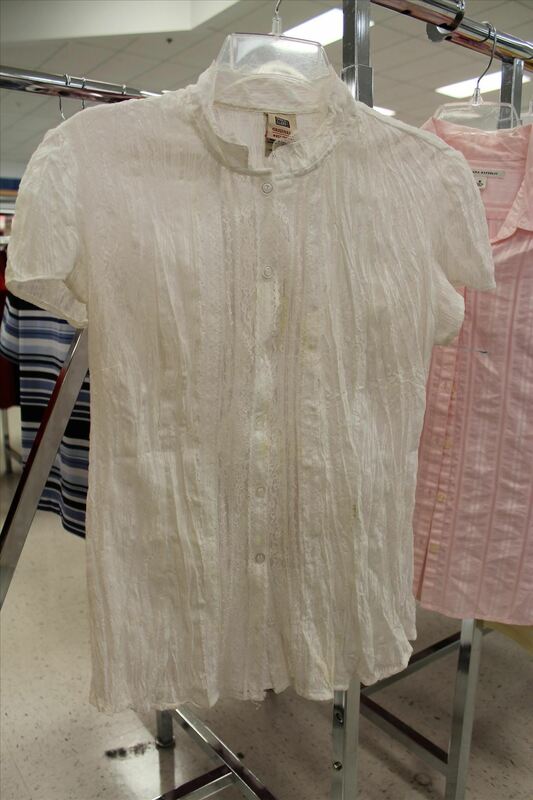 There are tuts online for reconstructing clothes. Just make sure the piece is large on you, that way you have room for pattern changes. I thought the exact thing! Buttons are STUPID expensive, great tip! Also try pieces of earings from thrift stores, good will & habitat for humanity stores too. Plus, victorians loved novelty buttons. Just read your article and I have to say that I am quite disappointed, I think the only thing I agree with is about the colour brown and the value of opshops. There are no rules in steampunk other than there are no rules. If I was starting out this how to would fill me with fear and put me right off. 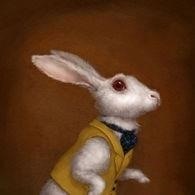 Dress to your character what ever that may be , keeping in mind the Victorian style. 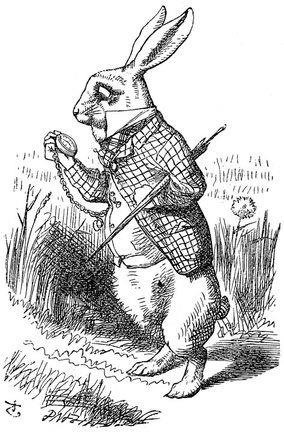 We time travel so there are many influences including modern, if it fits with your character. Study the history of fashion it will give you endless ideas, get out there and have fun the look will develop over time . Thanks Simon, I am only recently attempting the Steampunk look though I have been absolutely in love with it from the start (that isn't even a big enough statement for how I feel about this fashion) and I am a middle aged granny! My hubby and I are doing a Steampunk renewal of our vows for our 25th Anniversary in the next few years and now I have to try to bring this together with no real assistance (are there really this many different generations around me who do not know what this is???). Anyway, I get overwhelmed easily and worry that I will have to resort to the expensive ready made product! Not the true Steampunk mentality. I actually like the article. I'm not into the fashion so much as the weapons, goggles, and some of the other peripherals that are iconic to Steampunk. 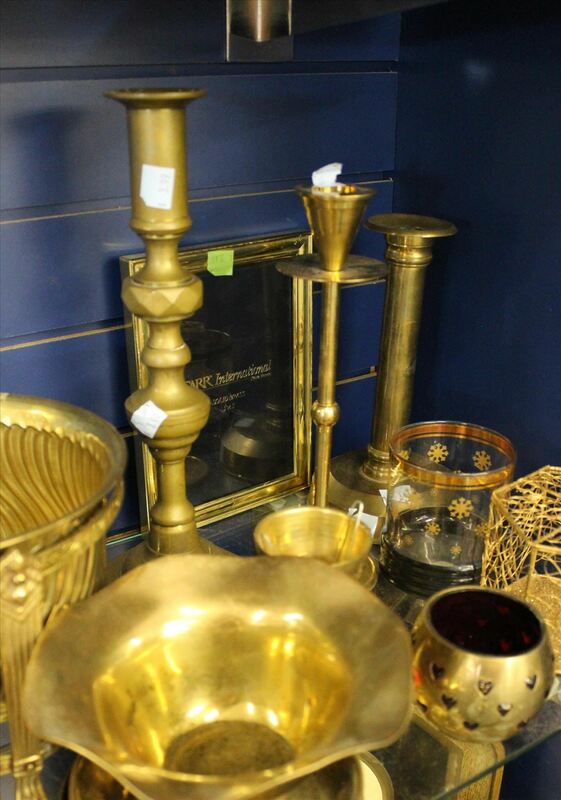 The brass "stuff" is great, especially the candle holders. I found two matching candle sticks and am planning on using them as "dueling" pistols. My wife cleans house for one lady that is always giving her things (usually broken) but sometimes of value and sometimes things I would only value like the broken candelabra she just brought home a couple of days ago. I can unscrew parts and use them different ways. Is there much of a market for the selling of Steampunk weapons? I've always found dollar store masks at thrift shops. They are my main source of feathers for my hats. I have to disagree with you here. A pleat is different from a crease- a crease is a fold, while a pleat is usually sewn in place. The pleat on the front of men's pants is sewn into the waistband, which is what makes the fabric pooch out a little and makes them look so unattractive to the author (and me!) There is no way to iron them out. Thanks for all the great information. Now I want to go to my local thrift store & Home Depot. Happy STEAMPUNKING. I enjoyed your article however the marching band pants are Class A, now retired, Army officer uniform pants. Our dog Bogi won the haven human Dogathon last year with the best costume ( and over all winner). Last year he was a Harley dog, this year we are making him a steampunk dog. I am so excited, but i don't think poor bogi is going to be as excited as I am. This article will be very helpful as we search for his costume. just go on google images to get inspiration for outfits, they vary a lot ! Most Steampunks don't own or know how to tie a cravat. You won't find that in a thrift store. I've also noticed that many Steampunks are clueless about a proper Bowler Hat. They should be made of fur felt, should be hard as a rock, and British. You won't find one of those in a thrift store either. Time to go hunting Thrift stores! (or "Charity shops" as they are called in the UK). For those that are still struggling on what is / isn't Steampunk, I would advise finding pictures of outfits you like online (as many as you can, but only high resolution ones so you can zoom in on the details on them), and then save the pictures onto your smartphone. When you are out "shopping" and come across something that you think may be suitable for your needs, check out your pictures and compare, asking yourself "is it the right style? / can it be altered to make it the right style?". Don't worry about the colour too much, as you can always dye it a different colour (provided the colour you want is darker than the colour it is). 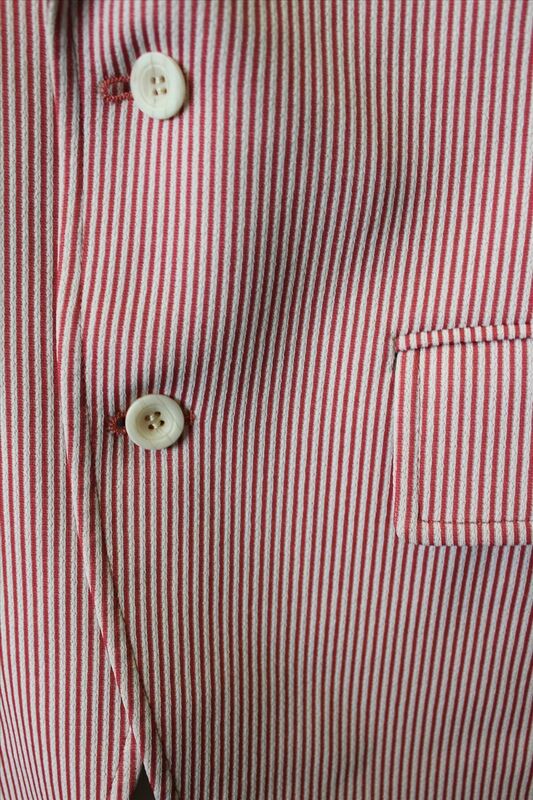 Things like buttons can be replaced with more suitable items, and seams that are sown in can be un-stitched and ironed out. Little tip for ironing out creases / un-stitched seams ... turn the item inside out, and spray the crease / seam with a starch solution (click here for an example), and then iron it (it may take a few attempts). 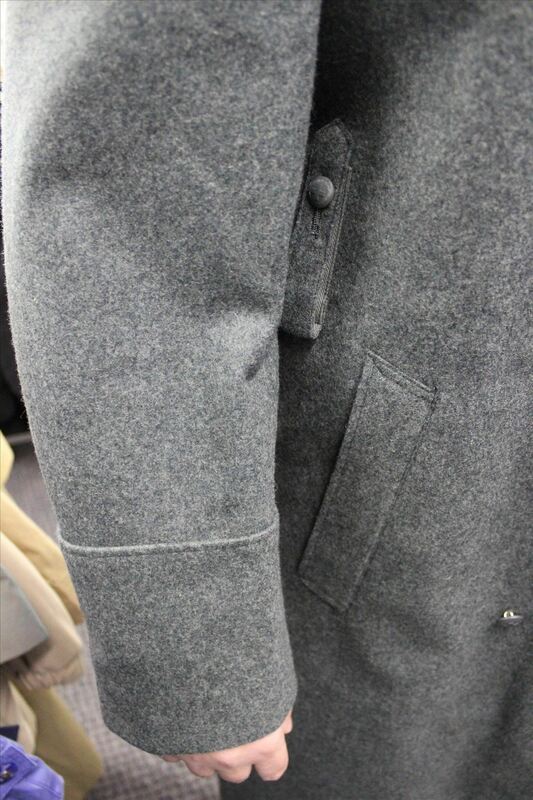 If you iron a crease / seam from the outside, you risk creating a shiny line where the crease / seam was. For stubborn creases, spray the material with water from a spray bottle so that it's damp. I would advise against using steam irons overall (you can use them with the steam option turned off), as if you have "hard water" the iron will make nasty marks on your material that won't go away. Hey guys! I am brand new to steampunk. I had actually never even heard of the term before a couple months ago (I know. I know... Don't hate me.) Anyways, I am a Youth Pastor, and believe it or not our theme this year for our Vacation Bible School is steampunk. 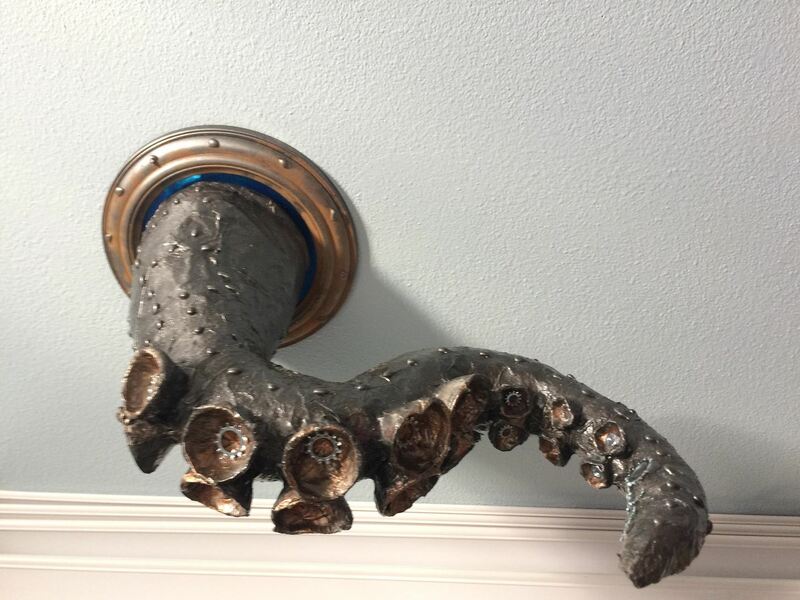 So I am looking for decoration ideas. I need things to decorate the halls and individual classrooms, and to decorate a main stage where the kids will go everyday. Any ideas would be very very helpful! Thanks! Don't worry Joshua, I am a middle aged granny & the only reason my kids & grandkids know anything about Steampunk is because of my husband & I. None of the variety of generations I work with know anything about it, though I have been talking about it for years. Now I just say "Google it" when I get the quizzical looks. 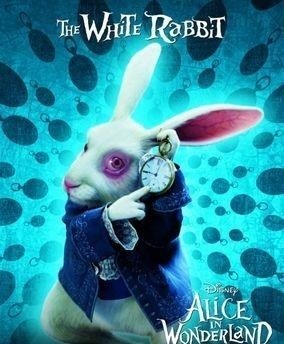 I am going to do a Steampunk White rabbit from Alice in Wonderland for Halloween. Although I have the hat sorted out pretty well, I'm stuck on the outfit. I have the shirt already. I can't afford $60 Plus dollars for a store bought Steampunk jacket. I need help with a jacket and pants idea. Any help would be greatly appreciate. Look at all sorts of jackets and vest. You have lots different styles you could use, change the buttons(using other used items buttons you like), lace hankies, lace gloves. Use acrylic paint to make clock, gear, etc patterns. Bottoms you could do vintage looking long bloomers that gather around your legs (use elastic to make), add tights(paint on designs). I think long rabbit ears would be adorable too. And a pocket watch. I thrive on "make believe" outfits since my proud youngster punk rock days in the 80's. I never outgrew my creativity, I grew into it. I began thrift store shopping at 15y. At 44y I'm proud of my collection of unique items I wear often. One day I may have my hair beehived and the next day white Dr Martins & a studded belt. To pretend is a release of stress and anxiety. 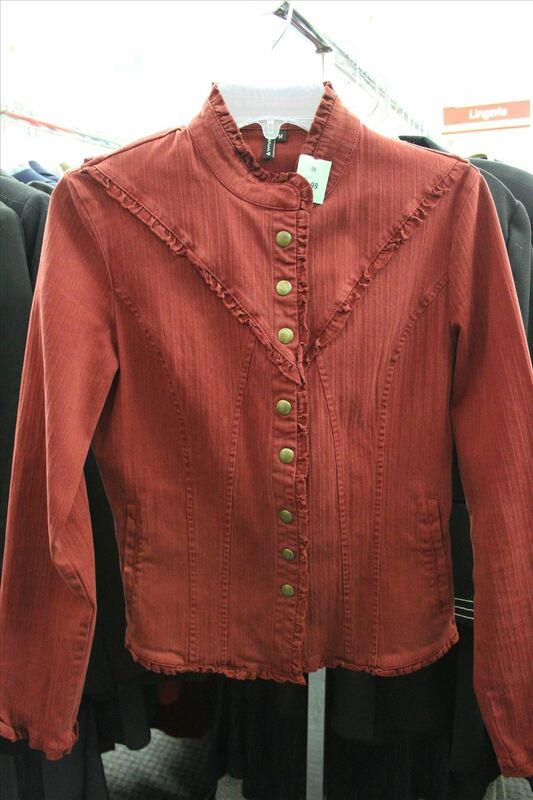 Thrift store shopping is way better than feeding corporate greed. Thanks again. Btw my profile pic w the blue wig. I found that wig while dumpster diving in a closed for good flea markets trash. 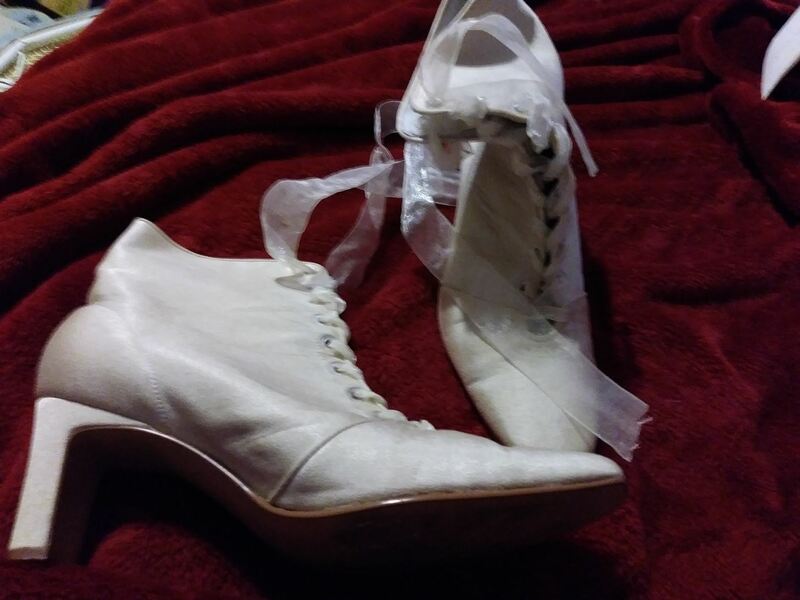 I found a pair of lace up cream color ankle boots that are perfect steampunk boots at a thrift store. Though they are a little big buti still wear them and they are perfect.